ທ່ານ. ສິນທະວົງ ແສງມຸນທອງ ແລະ ທ່ານ ນາງ ຈັນທາ ພູມທິເດດ ໄດ້ຖືກເຊີນຈາກ ສູນອາຊີມູນນິທິຍີ່ປຸ່ນ ເພື່ອເຂົ້າຮ່ວມງານຮູບເງົາສາກົນໂຕກຽວ ໃນ ເດືອນ 10 ທີ່ຜ່ານມາ. ພວກເຮົາຮູ້ສຶກປະທັບໃຈຫຼາຍທີ່ໄດ້ໄປຮ່ວມໃນງານເທດສະການຮູບເງົານານາຊາດໂຕກຽວຄັ້ງທີ30 ທີ່ປະເທດຍີປຸ່ນໃນຄັ້້ງນີ້ ໄດ້ເຫັນຜູ້ຄົນຫຼາກໜ້າຫຼາຍຕາຈາກທົ່ວໂລກ ໂດຍສະເພາະແມ່ນໄດ້ເຫັນດາຣາດັງຈາກຮໍລີວູດ ແລະ ທົ່ວໂລກ ບໍ່ຄິດວ່າເຮົາຈະໄດ້ເຫັນດາຣາຮູບເງົາດັງໆຕົວຈິງ ງານນີ້ຍິ່ງໃຫຍ່ອີ່ຫຼີ ມີຮູບເງົາທີ່ມີຄຸນນະພາບ ຫຼາກຫຼາຍໃຫ້ເຮົາເລືອກຊົມ ເຮົາຄິດວ່າງານນີ້ສຳຄັນຫຼາຍ ສຳຫຼັບຜູ້ສ້າງ ແລະ ຜູ້ຊົມຮູບເງົາ ຄື ຄົນສ້າງຈະໄດ້ວິທີການ ແລະ ຄວາມຮູ້ໃໝ່ຈາກແຕ່ລະເລື່ອງ ສ່ວນຄົນຊົມກໍຈະໄດ້ຄວາມມ່ວນຊື່ນ ແລະ ປະສົບການຊີວິດຈາກຮູບເງົາ. ຖ້າໄດ້ມີໂອກາດໄດ້ໄປອີກມັນກໍຈະວິເສດຫຼາຍສຳຫຼັບພວກເຮົາ. ພວກເຮົາຂໍຂອບໃຈທຸກຄົນທີ່ໄດ້ໃຫ້ໂອກາດຂ້ອຍ ແລະ ແມ່ໄດ້ໄປຮ່ວມໃນງານນີ້. 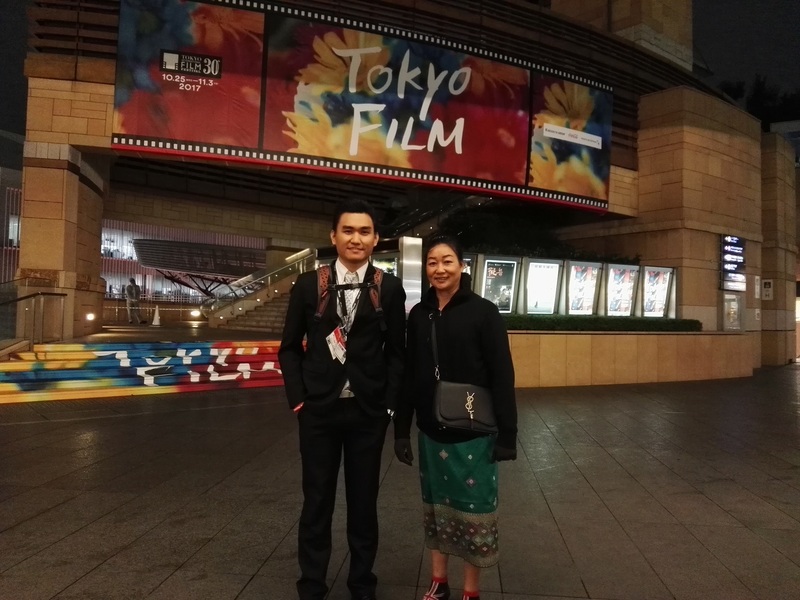 Mr. Sinthavong Sengmounthong and Ms. Chantha Phoumthidet were invited to Tokyo International Film Festival (TIFF) last October by the Japan Foundation Asia Center. The following report is their impressions about this event after returning. Our impressions about the “30th Tokyo International Film Festival (TIFF)”: We had an opportunity to meet many people related to the field of film, entertainment and media from all over the world. Moreover we saw some Hollywood stars. We had never thought that we were able to see those stars in person. This event was so huge and had a variety of quality movies screened. Audiences therefore enjoyed them and could choose their favorite one. We think this event was so significant for filmmakers and audiences. Especially filmmakers obtained new knowledge and techniques from each screened movie. If we had a chance to participate in the event again, it would be marvelous. Last but not least I and my mom would like to thank the TIFF and the Japan Foundation Asia Center for having provided us such a great opportunity to participate in the event this time.